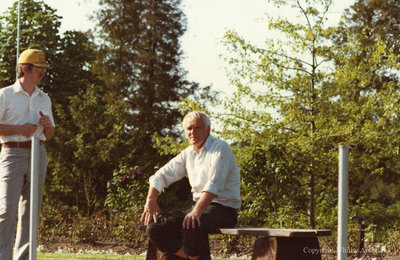 A colour photograph of Leonard Cullen sitting on a wood bench at Cullen Gardens. To the left of the photograph is Peter Cullen, Leonard's oldest son. Leonard and Peter Cullen, c.1983, Photographer Unknown. Whitby Archives A2013_042_275.